This is me. This is my joy. This is my passion. This is my place, my haven where there is no noise, just me myself and I, with my recipes. There is no distractions, only positivity. This is my therapy, this is what helps me build my strength, through the love, fulfillment and passion I feel for what I do. What started out as a hobby in September 2016, has now turned into my full time job, and I couldn’t be more grateful, especially because It doesn’t feel like work. Recipe creation, styling, nutrition and plant based lifestyle coaching are my loves, my happiness, and I’m so happy and grateful and honored I get to share them with you every day. I encourage you to explore, to try new things if you haven’t found your place yet, that place where you are your happiest just with yourself. Don’t give up, persevere and you will succeed I have no doubt. Thank you for being a part of my everyday, a part of our HH community and for all your comments and words of encouragement. I couldn’t do this without you. Add dry ingredients into large bowl, then add wet ingredients and whisk everything together till the flavors are well enmeshed and absorbed. Then line your cake / bread tin with parchment paper and pour your mold into it. Slice a banana in half length wise, place it on top of your mix pushing it slightly into the mix and add a bit of brown sugar or coconut sugar on top to caramelise. For the plating, you have two options. 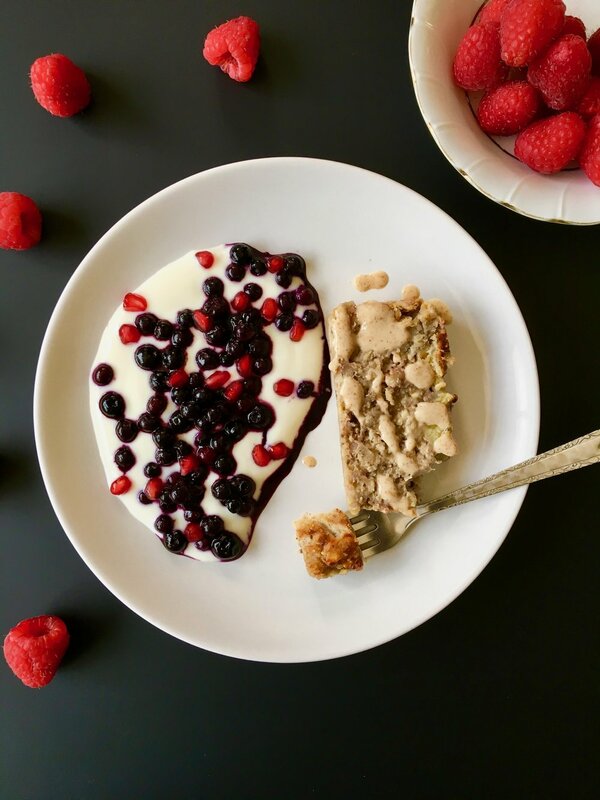 Option1: The image above: Make an almond butter vanilla sauce, by mixing 2 tbsp of almond butter, 1 tsp of vanilla and 2 tsp of water, mix to liquify and add on top of your banana bread. Bon appetit! And don't forget to check out the full video on my Youtube Channel!